Picture saying your wedding vows on a private white sand beach against the backdrop of a spectacular villa right out of the Lifestyles of the Rich and Famous. No need to worry about wedding decorations, wedding cakes or flowers - everything can be taken care of by our experienced wedding planner to make your wedding as simple or as elaborate as you desire. 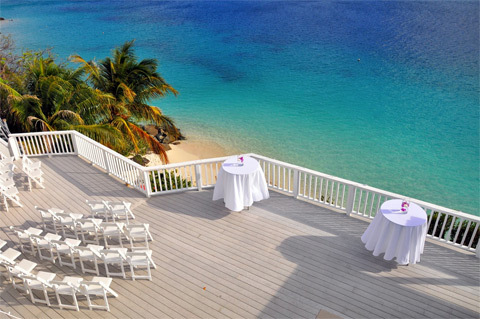 Combining a wedding and honeymoon in a tropical location is a recipe for unforgettable, romantic memories. Your honeymoon starts immediately after the ceremony and wedding toasts, not after a tiring day of airport security, airport transfers, and connecting flights. What a relaxing and no-stress way to start a marriage! Click on the links above to view how others have had their dream wedding come true at Sand Dollar Estate!